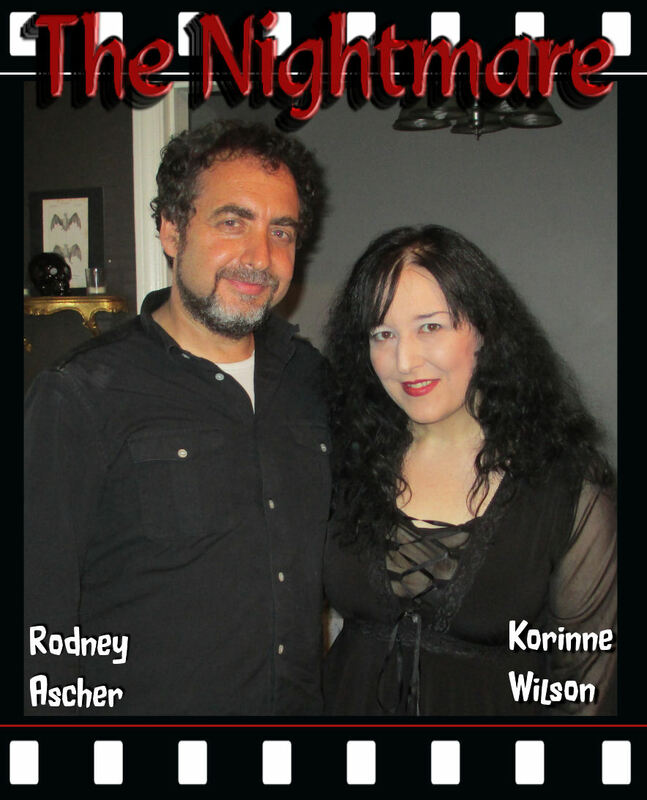 Rodney Ascher Director, Korinne Wilson (Occult Priestess) interviewee. Filming The Nightmare Documentary. Greetings and Salutations. You have found this blog because you want to understand beyond the Mysteries, pierce the veil of illusion and see with your single eye. As the Priestess and revealer of the Unseen, I will guide you through this most frightening journey, from darkness to light. My name is Korinne, the “French” version of Kore. Kore is the Goddess who came from the light to learn from and to overcome the underworld. My life mythos closely follows the Kore/Persephone myth, the Maiden and the Darkness. My life began the mirror image of this myth through Sleep Paralysis; where I had a Real boogeyman tormenting me throughout my adult development. 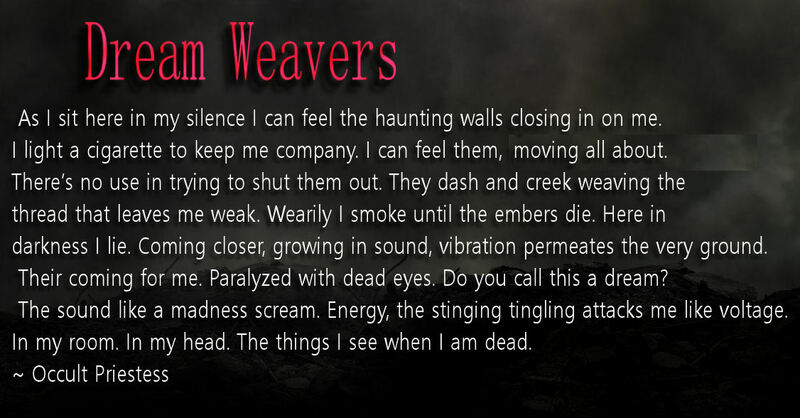 Sleep paralysis is often accompanied with haunting feelings and a shadow figure, alien or creepy creature. For me it was always the Shadow man. Sleep Paralysis always followed the same pattern. I would lay down; soon a wave of utter exhaustion would wash over me. My limbs grew too heavy to move and my eyes sealed shut. I could not move, not even an eyelid. I have not discovered the full story behind sleep paralysis. I do know it occurs as a common side effect of astral travel. The vibration in my body rose so much that I could feel it just like an arc of electricity. In order to astral project our energy must rise, or vibrate at a higher rate to get the soul out of the body. Sleep paralysis is a distorted disoriented state of consciousness that triggers our primordial fight or flight response (possible fear of death), thus causing our brain to release large amounts of “Fear” or “Defense” chemicals into our emotional system. Perhaps the body’s response to being awake and paralyzed confuses our delicate electrical system? Could the chemicals released cause the hallucinations, or is our mind actually aware of an alternate dimension in which these “dark creatures” or “aliens” live? Currently I am 36 and an educated occultist and professional psychic/channel. I feel I have the “training” to find and figure out the “Shadowman”. I do not take Carl Jungs psychological explanation as an “excuse” for the shadow. I do not believe in the concept of “Evil” or a devil. Like I said that Shadow seemed “not of this world” so I have no knowledge that it was actually trying to hurt me. I don’t blame the shadow … I am just curious to the point of being angry. For more on my Personal Experience with Sleep Paralysis See my Youtube Channel. Ted Torbich E-mail: Hi Korinne! Hope all is well for you. I received a msg. from someone who is a documentary maker who expressed an interest in interviewing you. Ted Torbich is the host of “THE STENCH OF TRUTH” radio show. This is the Interview that got Tim Kirk’s attention. My e-mail to Tim Kirk: I received the following e-mail from Ted Torbich via facebook. Thank you for thinking of me. Send me some details and I will be happy to reply. In early August of 2014 the Interview you see in “The Nightmare” documentary, took place in the early evening twilight. Rodney Ascher as a person, and a director was very Kind and genuine with me. He made no attempt to inform my experience, or manipulate my story in any way. He answered all my silly questions, and made me feel at ease. The crew also made me feel welcome. I got the feeling Rodney and the crew had been through a lot with this movie, the terrifying experiences, they almost seemed a bit shell-shocked. I know at times I felt like a war veteran recalling the horror of the battlefield. The crew exuded a presence of dark understanding, that hung in the air. While my segment was being filmed, I tried a little experiment. I laid down on the couch and allowed my consciousness to re-experience a paralysis event. I placed my consciousness into a memory of Sleep Paralysis from age six. As a well-trained psychic this was quite easy to do. I saw the Shadow man walking towards me and psychically asked him what he wanted. I saw his blackness come toward me, to cover me, and then, to enter me. The Entity was attempting to possess my body while my consciousness was “dreaming” in a higher dimension. I have since come across many instances of sleep paralysis sufferers feeling a dread, that the Shadow Man wanted to take over their body. After the Filming I treated Rodney Ascher to a Tarot Reading. I can reveal, I told him “the Nightmare” Film would perform very well! My lips are sealed on the rest. I have yet to see “The Nightmare” myself, I look forward to it. Tweet: Devin Faraci : If, as some speculate in THE NIGHTMARE, sleep paralysis can be spread by talking about it, @Rodney_Ascher is an irresponsible filmmaker! #NightTerrors: Rodney Ascher’s Sleep Paralysis Doc ‘The Nightmare’ Gets a Release Date! SXSW, Gravitas Ventures has announced they will be releasing it in North America in select theaters and VOD on June 5. David J. Hufford: Author of “Terror that Comes in the Night”. In my opinion Hufford is still the most researched expert on Sleep Paralysis. I contacted him in 2002 and shared my story with him. He commented that I had the most persistent case of Sleep Paralysis he had ever heard. Youtube Link to an Epic Interview with Hufford. Occult Priestess: Collected Sleep Paralysis videos PlayList. Want more “Weird Stuff”? You will Go Crazy over Freeman Fly! !